This was a surprisingly good police mystery. I say surprising because it was a hardcover book that I found at the recycling depot, it had no dust jacket thus no review to entice me. The only reason I rescued it was because the author's last name was the same as my daughter's first name. Not one of the best reasons for choosing a book, but it worked. Several murders have occurred in Los Angles where the killer has left a card upon the body which reads "The Vengeance is Just". Now Mendoza and his team are in a race to determine why and who before he strikes again. At times reading this book was like opening a time capsule. Imagine no cell phones to reach a detective when he's away from his desk, no computers to do research, having to go to a records room to search through tonnes of paper files, no DNA traces to compare and having to manually compare fingerprints. Dell Shannon was the pen name of Elizabeth Linington. She also wrote under the names Ann Blaisdell, Lesley Egan, and Egan O'Neill. She was a very prolific author with dozens of books to her credit. Thanks to Chapters.ca for use of the cover image. Hello! I found your page simply because I could not remember the real name of Elizabeth Linington. 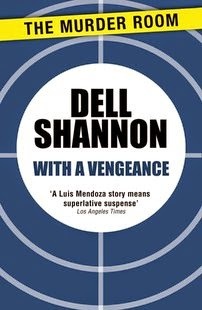 Fifty years ago, when I was a high school kid working in the public library, I used to wonder about all these very popular books by Dell Shannon. Ten years later I was a mom who was stuck in the house, and I read most of the Louis Mendoza stories then. They were great! I find myself wondering whether they would seem "dated" if I read them again.